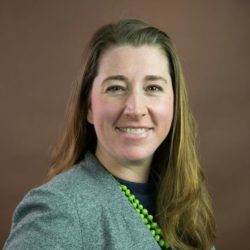 Allison Meisch is a developmental psychologist with more than 16 years of experience in quantitative and qualitative methods, program evaluation, applied research, and technical assistance. She designs and conducts rigorous evaluations and applied research in home visiting programs, foster care systems, and early care and education settings. She also has expertise in disseminating evaluation processes and findings. At JBA, Meisch is the project director for Expanding the Evidence: Building Evaluation Capacity, which provides technical assistance and evaluation capacity building to grantees of Annie E. Casey Foundation’s Race, Equity, and Inclusion initiative. She is the deputy project director of the National Home Visiting Resource Center and project director of the Early Education and Out-of-School Time Capital Grant Program Evaluation. Meisch also provides evaluation technical assistance for the Design Options for Home Visiting Evaluation project and directs a pilot study of a toolkit that helps two-generation programs develop data governance plans. Her past work includes a rigorous outcome evaluation of an intervention designed to reduce length of stay in foster care and the provision of technical assistance to the U.S. Virgin Islands for a child care quality improvement rating system. Meisch received a Ph.D. in human development from the University of Maryland.